Sometimes simple is the way to go when it comes to describing what goes in to the dishes at Walt Disney World. 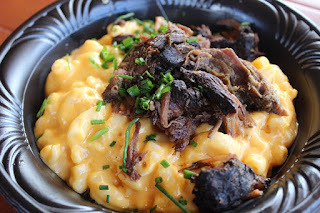 And when it comes to comfort foods, there is almost no explanation needed, although we’re going to give it a shot today with our review of the Pot Roast Macaroni & Cheese. That is the entire listing for the beloved dish that comes from the Friar’s Nook in the Magic Kingdom, Pot Roast Macaroni & Cheese. There is no talk about the cheese saw, the fork tender pot roast, or the garnish of green onion. There doesn’t need to be, you get the entire picture just from a few words. This is a dish that everyone knows and welcomes, especially children, amped up with the inclusion of chunks of pot roast. What you may not realize is that this is not some simple side dish that’s gone in a few heaping forkfuls. Instead, the Pot Roast Macaroni & Cheese is a full, adult-sized bowl of steaming goodness. Here’s where things might get a little tricky. Everyone has their own opinion about what makes the best macaroni and cheese. Some like the panko crusted, oven baked variety compared to those that love cheese sauce on the stove top, while still others may be particular about shell pasta versus elbow macaroni. 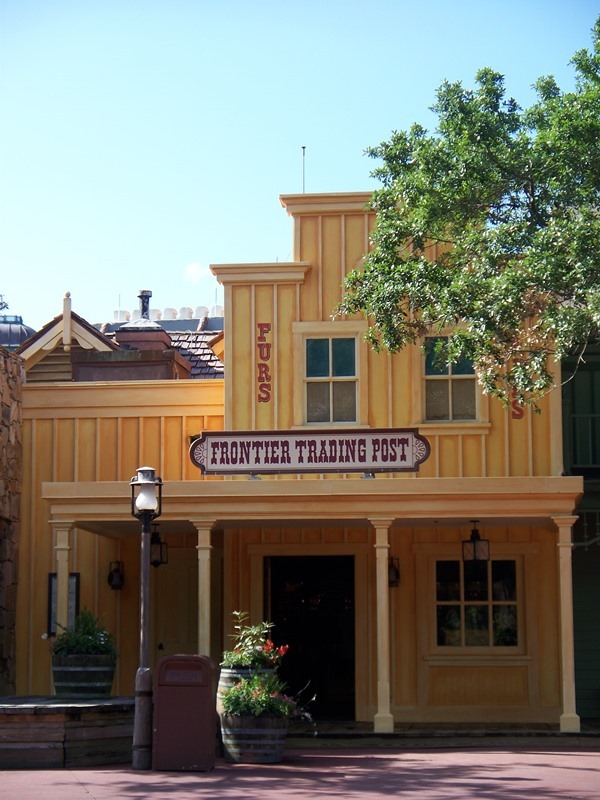 What we all need to remember is that this is a quick service meal served in the heart of Fantasyland, arguably the single busiest land in any park of Walt Disney World. This dish has to be quick and satisfying to the masses, and that means keeping it simple. Simple ingredients. Elbow macaroni covered in cheese sauce, check. It’s not quite the liquid gold that we became used to finding on fixin’s bars, but it is close. The post roast is tender and breaks apart easily with the fork. It is served on top of the macaroni. That means if getting the ingredients mixed together is your cup of tea, the bowl makes that easy, but you can also enjoy them separate of one another. Lastly the green onions scattered on top. It may be comfort food, but there had to be something green in the dish! Long and short, there are a couple of options when it comes to the macaroni and cheese at the Friar’s Nook, but the real winner is the Pot Roast Macaroni & Cheese. It is filling enough to keep you going, but not so heavy that you won’t have room for that Citrus Swirl a little later. This is a dish that you will come back to again and again. Quick and easy and comforting, what more could you ask for? Never you mind the Christmas window dressing, the true subject of today’s article lies in the poster sitting behind the hats which features, well, a pair of hats. 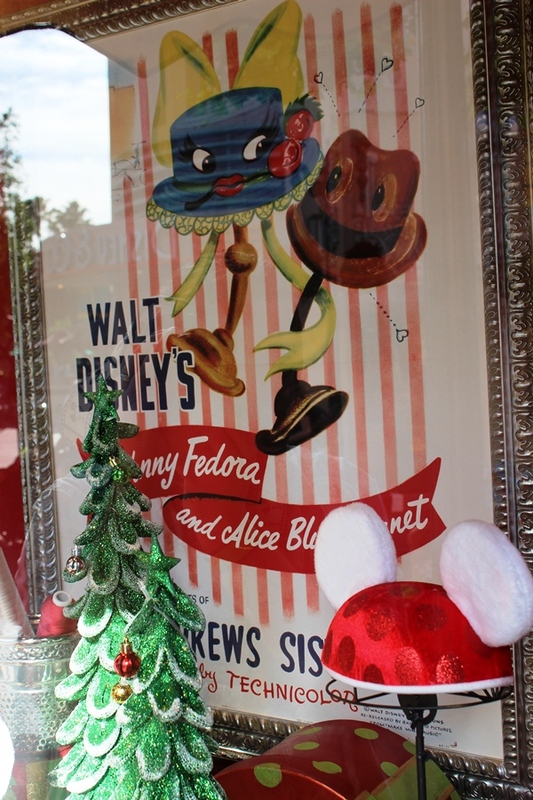 This window belongs to Adrian & Edith’s Head to Toe, the perfect place to don your Mickey Ears, on Hollywood Boulevard inside Disney’s Hollywood Studios. Let’s dig deeper into why this poster is the perfect one-size-fits-all fit for a shop specializing in hats. The headline here is the feature of Johnnie Fedora and Alice Bluebonnet. The story was featured in the April 1946 release, Make Mine Music, as the ninth of ten sections in the anthology. Although Casey at the Bat or Peter and the Wolf may be more easily recognized, the story of Johnny and Alice is beautiful for its simplicity. It was so well received as a part of the animated package film that Johnnie Fedora and Alice Bluebonnet would go on to be released as an independent short in May of 1954 and would be features as a Disneyland Little Long Playing Record in 1970. The story tells the tale of two hats, a blue sunhat with exquisite trim named Alice and a grey and brown fedora named Johnnie. The pair meet in the shop window of a Bonton department store. The pair fall in love, but are separated when Alice is purchased. Johnnie is also purchased shortly thereafter, and spends a majority of his time looking down alleys and in windows for any hat he can find that may be Alice. Mishaps ensue that include a shootout and torrential rains, where Johnnie finally loses all hope that he will ever see his beloved Alice again. He is eventually picked up by an ice deliveryman, who cuts holes into Johnnie so that he can sit on the head of one of his horses for shade. Low and behold, perched atop the other horse’s head is none other than his long lost love, Alice. It’s worth note that the poster lists the pair as Johnny Fedora and Alice Bluebonnet, which is the common spelling of the two lead characters. However, the short’s title card presents Fedora’s first name as Johnnie. That’s the rationale for how we present him here. The entire tale is narrated, as noted on the poster, by The Andrew Sisters. The story is completely heart wrenching, much in the way we feel for the characters in The Blue Umbrella or Lava, like the latter the song makes the story that much more tangible. 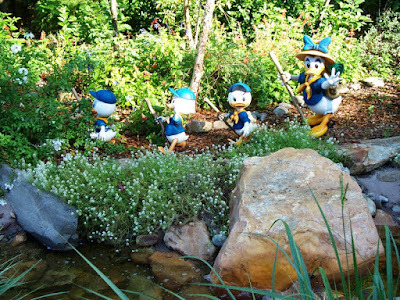 The Andrews Sisters were utilized several times by Disney, and can even be found elsewhere inside Disney’s Hollywood Studios. Two of their songs, Boogie Woogie Bugle Boy and Don’t Sit Under the Apple Tree, can both be heard along the Sunset Boulevard thoroughfare. Whether you are a fan of The Andrews Sisters, classic Disney animation, or just a sucker for a sappy anthropomorphic love stories, Johnnie Fedora and Alice Bluebonnet is well worth taking the seven and a half minutes to give it a chance. Either way, you now know the tale behind the hats that watch over Adrian and Edith’s! 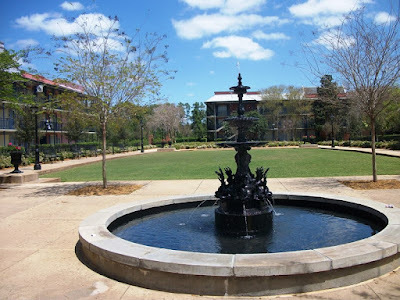 Everyone is back at work or school. The decorations are down and packed away, mostly. The holidays are gone, leaving only the bitter chill of January. As we trudge through our day to day lives there is always a part of us that wants to keep the spirit of the year all year long. That feeling where we are overjoyed to see our friends and family, dreamed of delicious dinners and desserts, and when we recall childhood memories of a time when we cared less about the outside world and more about peering into a night sky to see a speck of glowing red soaring across the sky as we awaited the arrival of Santa Claus. Of course, Santa Claus is now on a well-deserved vacation. Luckily, you can visit him while he’s on vacation! 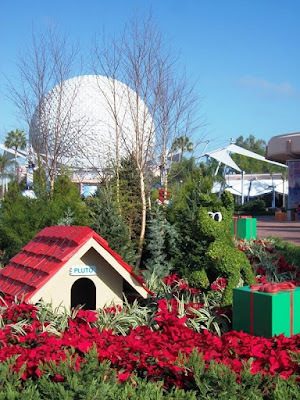 Sure, Walt Disney World has Christmas shops scattered around property that can give you a jolt of the holiday season in the form of a Christmas countdown, a shiny new ornament, or some Christmas music to listen to in July, but that doesn’t quite imbue you with the same childlike giddiness that Christmas is known for. 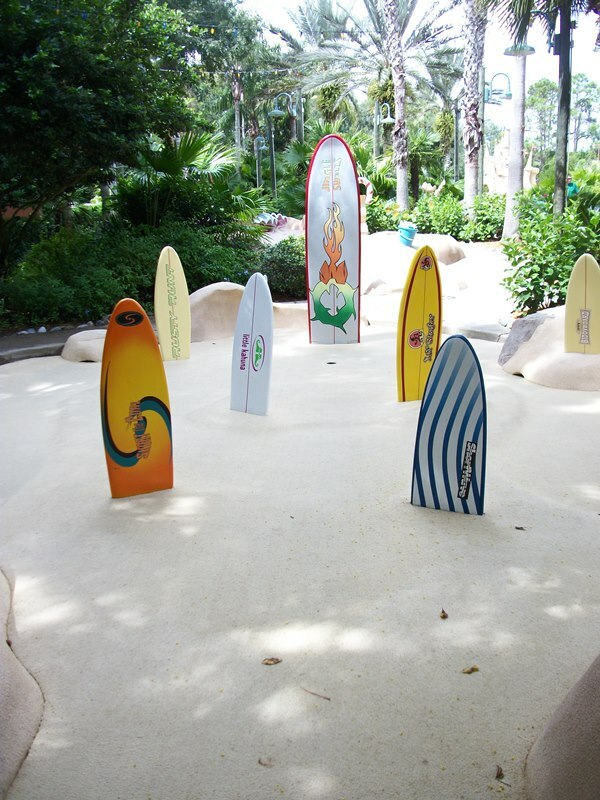 For that you need to head over to Winter Summerland Miniature Golf. 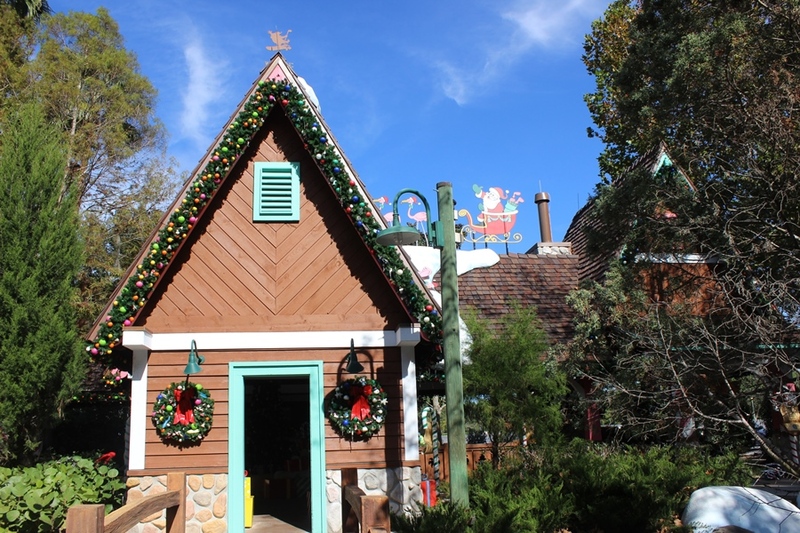 At Winter Summerland you will find Santa, his reindeer, and his entire crew of helpers have settled in to central Florida for some rest and relaxation. 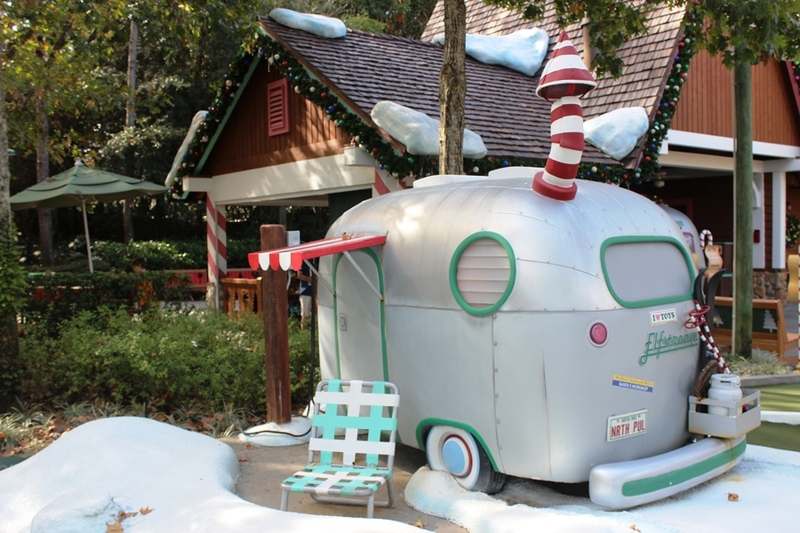 Lucky for them, they settled on a location near Blizzard Beach Water Park, which gives them access to sun and fun and the winter activity they are already familiar with at the north pole. The elves busied themselves with constructing two 18-hole miniature golf courses. 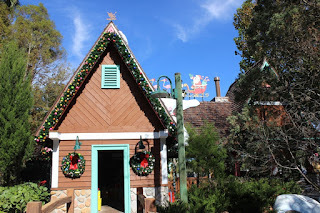 One course highlights the Summer season of Saint Nick’s vacation, the other plays with the Winter activities we know so well, but given a slightly different twist. The details here are truly worth a leisurely stroll throughout the courses, and while each course mirrors its counterpart, there are many unique reasons to invest the time in playing both the Summer and Winter courses. Sand and snow castles are the big wienies that draw in your attention, but be sure you’re looking and listening very closely. The trailers the elves inhabit are not Gulfstreams, but rather Elfstreams, and they are decorated with incredibly witty bumper stickers. Check out the names of the surfboards, the postcards around the fireplace, and clues given to you for each hole. Listen for beach bum carols or more traditional favorites. Sight-gags abound, such as how did Santa manage to leave ski tracks on either side of that power pole, the instructions for chestnuts that should leave you singing, and even the computers left behind by the big guy. There are also gags designed to get even the most cautious of putters wet; I’m looking at you Squirty! No matter which course you play, and who comes in under par, you’ll leave Winter Summerland a winner. Why? Because by the end of a round you’ll have giggled your way through the wordplay or at the frustration of your spouse six putting their way through a par two. You’ll have stopped to take a photo or two, hopefully with your friends in family in view. Most importantly, however, you’ll have memories to carry with you for the coming year and beyond and you’ll cherish the time you had together. In the end, isn’t that what Christmas is all about? Bread is a staple around the Gazette household. A nice piece of bread and some quality butter, or other spread, is always welcome at our table. 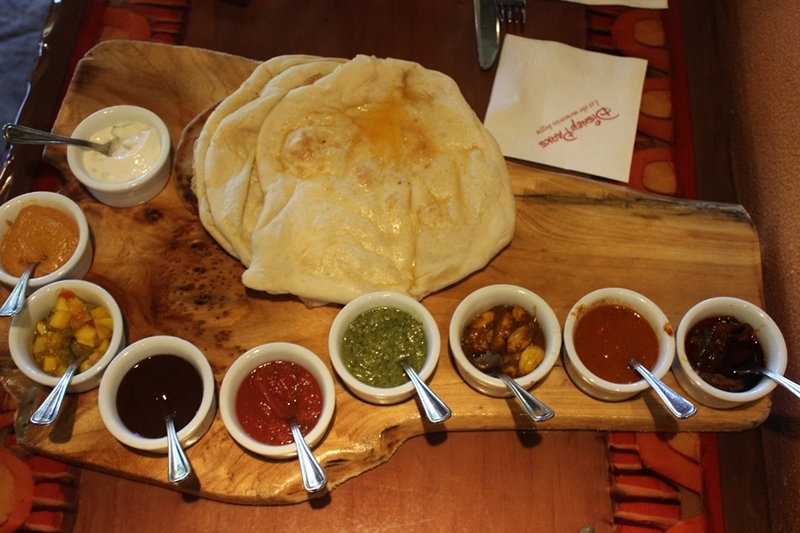 It’s no wonder then that we have always had a love affair with the Indian-style Bread Service from Sanaa for quite some time. In fact, we reviewed the service back in 2013 in Serve with Flair. Recently, however, there has been a change in the offerings of the bread service. Let’s start with the smallest change, the breads. Previously you have had a choice of three breads from a list of five. Now, it is a selection of all five breads: Traditional Naan, Garlic-Ginger Naan, Spiced Naan, Onion Kulcha, and Paneer Paratha. The Paneer Paratha replaces the crispy sheets of bread known as Pappadum, and my heart may never be the same. To give you a primer on the breads, naan in a lightly leavened, white-flour flatbread that has the appearance of pita but is much chewier. Paratha, on the other hand, is unleaved flatbread made with a whole wheat dough. It is still tasty, but not to the same levels of naan or pappadum in my book. Regardless, it is nice to not have to choose between the breads and just have the full selection at our disposal. The major change comes from the accompaniments. Until now you were given a selection of nine to choose three from. For a few dollars more you can now have the full range of nine accompaniments. They are: Cucumber Raita, Roasted Red Pepper Hummus, Mango Chutney, Tomato-Date Jam, Tamarind Chutney, Coriander Chutney, Garlic Pickle, Red Chile Sambal, and Spicy Jalapeno-Lime Pickle. If you order the full carousel of spreads, the place them around the serving board in order of spiciness. By that, I don’t mean which accompaniment uses the most spices, as this is Indian cuisine there are a lot of spices present, but which is actually going to cool your taste buds and which ones will scorch your tongue. I’d love to tell you which spread is the best and which ones to avoid, but that truly is a matter of taste. When my wife and I each picked out our favorite three accompaniments to see if there was a consensus, we both picked three different offerings from all across the spectrum. It should suffice that I don’t believe there is a bad bite in the smorgasbord. The full bread service may look like a lot of food for an appetizer of sorts, but trust me when I say that you will chomp through it in no time and still have room for your meal. Although you may want to keep some of the accompaniments to use with your meal, a common practice I’m led to believe. The Indian-style Bread Service is my go to item at Sanaa, which is saying something considering the amount of wonderful dishes on the menu. The ability to order the full spread offerings is a welcome change, and one that will surely keep us coming back to Sanaa time and time again. There are many trinkets and mementos scattered about Jock Lindsey’s Hangar Bar, but no artifacts! 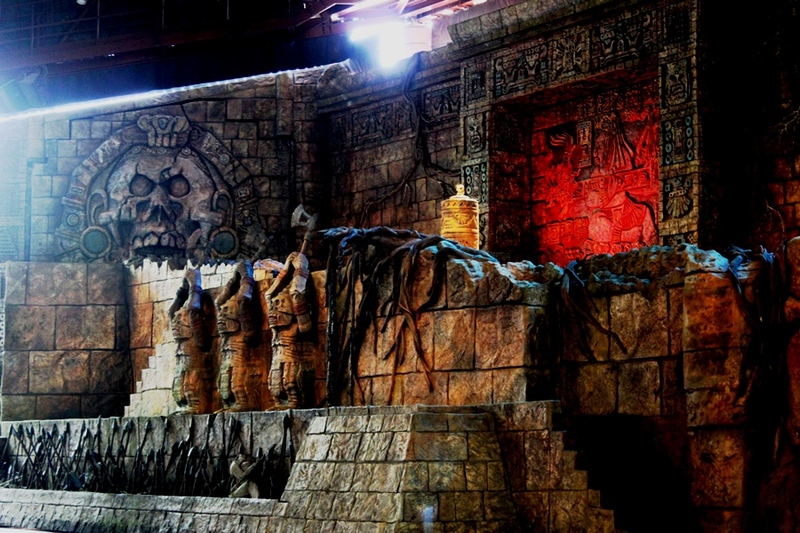 Artifacts are relegated to museums where they belong! For the pieces that occupy every available shelf and corner in the rest of the hangar, you can tell there is a lot of history and stories to be gleamed from them. For some it will mean some research, or recalling facts learned long ago. There are other pieces, however, that just require a bit of looking around the bar to get more of the story. While we will probably never know exactly what mission Mr. Lindsey was engaged in, it is fair to assume that the diving bell will join the ever growing menagerie of odd items that are increasingly filling up Mr. Lindsey’s home. 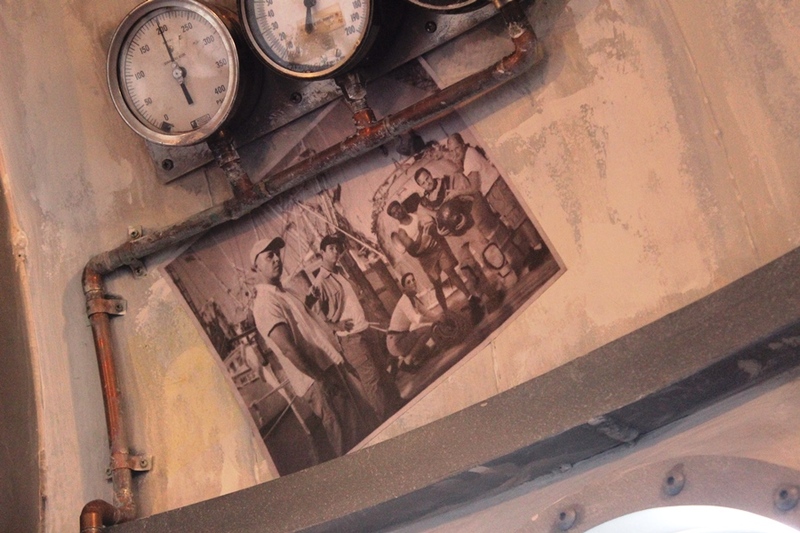 They weren’t joking about Jock’s home filling up, but these are the details that add life to the Hangar Bar. 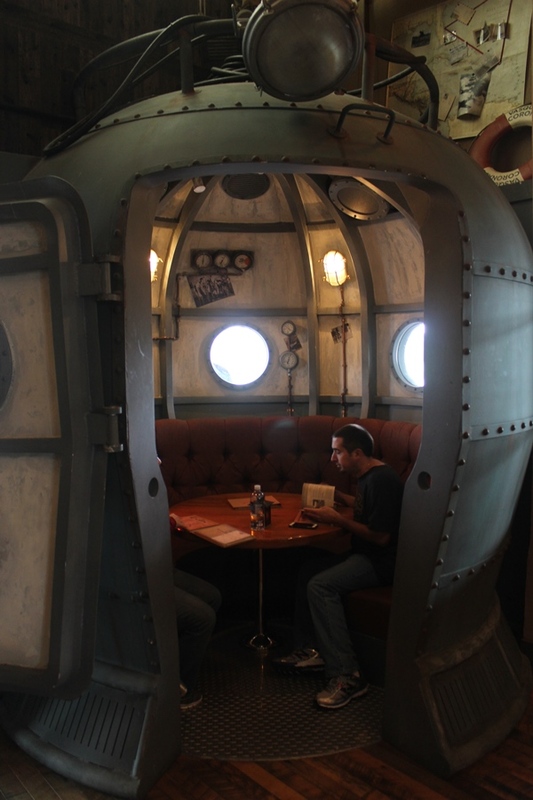 The next time you’re hanging at the Hangar, and happen to find yourself inside this mysterious diving bell, look around at the photographs inside. There are a lot of amazing individuals that Jock came across in his travels! 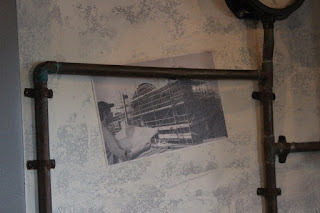 Perhaps no photo is more important to the place, however, than the one of Jock overseeing the construction of the Hangar Bar himself.